Lived almost two career lifetimes in public relations. Room for 26 years in the agency world, 15 years in corporate. Along the way, I’ve served as National President of PRSA and ever since have labored with love in the field of formal education for public relations. Pretty ironic since when I was in college, who had ever heard of it? And my mother, bless her, always thought public relations sounded like something no-nice-girl should be involved with. Among good colleagues such as you, I confess that I can’t recall ever having consciously planned one single step of the career way. 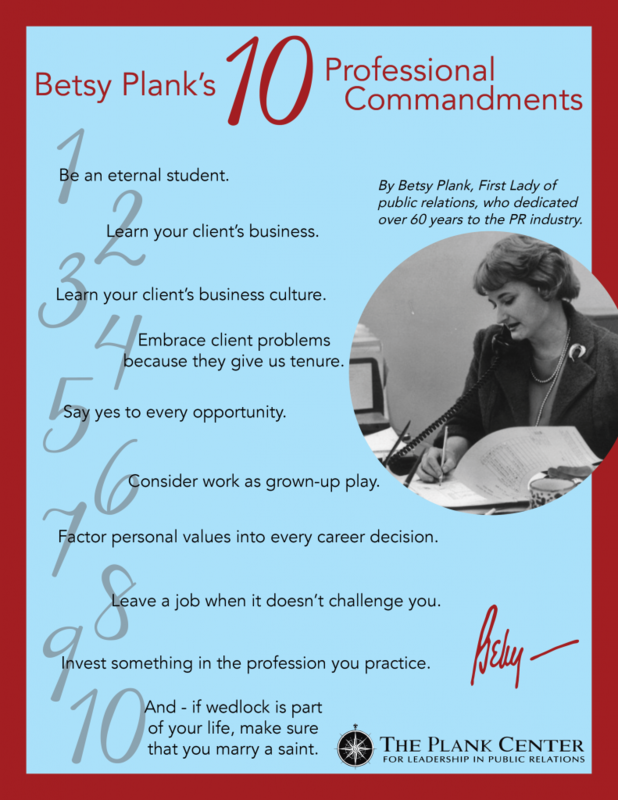 I do have my own 10 Professional Commandments. Learn your client’s business culture. Embrace client problems because they give us tenure. Say yes to every opportunity. Consider work as grown-up play. Factor personal values into every career decision. Leave a job when it doesn’t challenge you. Invest something in the profession you practice. And – if wedlock is part of your life, make sure you marry a saint.